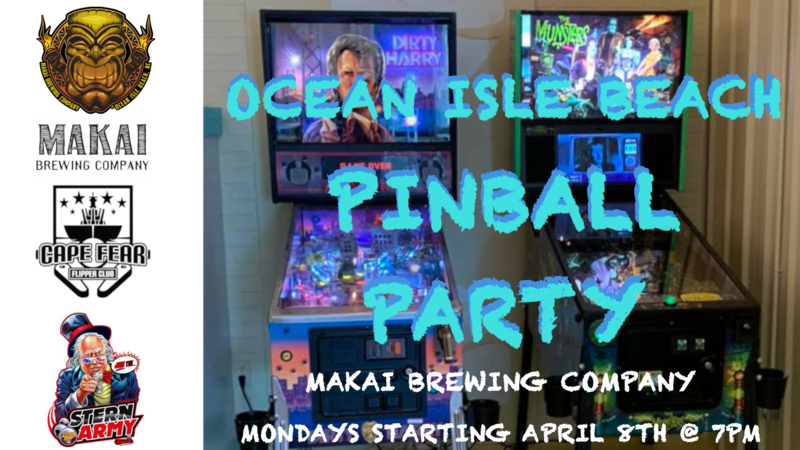 Starting Monday April 8th, Cape Fear Flipper Club is hosting a casual pinball league at Makai Brewing Company on Ocean Highway (Rt 17) in Ocean Isle Beach from 6-8pm. No previous experience needed. We will play in groups of 3 or 4 people for 6 rounds alternating between the 2 perfectly maintained pinball machines. Earn points and bragging rights each week with prizes for the top 3 finishers after 8 weeks. There is no registration fee and all participants will be registered with the International Flipper & Pinball Association. Players are only responsible for their coin drop ($0.50-$1 per round) and a 1 drink minimum (beer, wine, cider or non-alcoholic kombucha). If you've ever been interested in learning more about pinball, rekindling old nostalgia or just looking for something to do on a Monday night, this is a great way to meet people and have fun. All are welcome to participate or watch.